ntsocialism. : Malaysians: First to catch 'Transformers'! 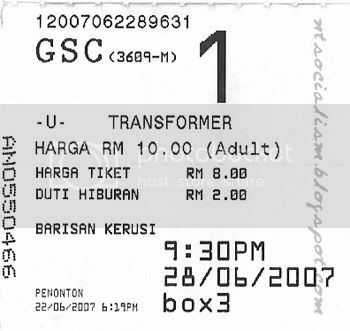 Malaysians: First to catch 'Transformers'! I caught an article on today's The Star newspaper and it was highlighted that Michael Bay, the director of the upcoming 'Transformers' movie is not a fan of the original cartoon series. My theory is that he is playing it safe by suggesting that because, after all, Megatron as a fighter jet and dorky Bumblebee as a sporty Chevy Camaro doesn't fit well into the minds of twenty to thirty year olds who will be catching their favourite 5 pm cartoon in real live action this coming July. My intuition is telling me that IF the film becomes a successful franchise, he will then revoke that particular remark and embrace the love and kisses from many TF fanboys out there. Good lesson in politics, Mike! ...my crew and I will be the very first few to catch 'Transformers' next Thursday!